"Across Britain, communities are finding ways not only to survive in an increasingly hostile system, but to fight for a better future. Something's changed in Westminster, too. The wolves have shed their sheep's clothing" writes Marienna Pope-Weidemann in the Huffington Post. The cuts keep coming but resistance has been rising with the heat this summer. 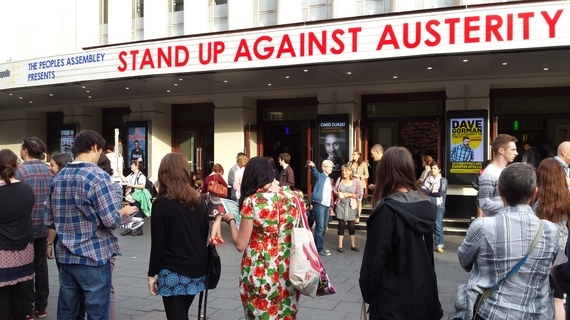 This week at the Hammersmith Apollo, Jo Brand, Jason Manford, Francesca Martinez and more of Britain's best comics Stood Up Against Austerity and helped fundraise for the People's Assembly Against Austerity. Last Saturday the People's Assembly led 50,000 people to parliament along with the National Union of Teachers to demand the alternative, and 10th July will be a mass strike day for some of our major unions. Across Britain, communities are finding ways not only to survive in an increasingly hostile system, but to fight for a better future. Something's changed in Westminster, too. The wolves have shed their sheep's clothing. The Lord Mayor's Banquet last year was a sign of our times. Rising from a golden throne in one of those penguin suits that belong on Downton Abbey, our Prime Minister proclaimed his support for permanent austerity from a matching golden lectern without a hint of irony. "A leaner state" is what he called for - not leaner in terms of the hundreds of billions blown on corrupt bankers, nuclear weapons and costly foreign wars, of course, just trimming the unnecessary fat - stuff like healthcare, education, emergency services and housing. The things we don't really need. What Cameron did do at the Lord Mayor's Banquet was to change the austerity story - cuts were no longer just necessary because there is 'no alternative' - they were right. It was right that we become the most unequal society in the developed West; that education for the children of working families means a lifetime of debt; that benefit cuts and the bedroom tax have pushed thousands of British families onto the streets; that the safety net for the most vulnerable in our society has been torn up; that up and down the country libraries, hospitals, fire stations and childcare centres are blinking out of existence. The historic transfer of wealth from the 99 to the 1 per cent that's enforced in this government's War on Welfare is no longer being defended in terms of economic necessity, but on moralistic grounds. Following the financial crash, £1,300 billion public money was served up to the City in the form of an all-you-can-eat Bailout Platter. In Iceland they had a referendum on that, which determined the money was better spent on the majority of the population that hadn't destroyed the nation's economy. But in the UK we were fed the line that bailouts and cuts were compulsory stops on the 'road to recovery' and reducing 'our' national debt. Flogging public assets at a loss was apparently the way to do it, even though some of our richest corporations pay little or no tax and trillions aresquirrelled away by the rich in tax havens. UK Tax Research estimates that closing tax loopholes would erase the national deficit in two years without cutting a single public service. The government did need to change the story, of course, because austerity hasn't fulfilled its stated aims very well. Employment is going up only as fast as the quality, security and wages of those jobs are coming down. Our national debt has, inevitably, increased - the government spent an Unimaginable Sum of our money on banks deemed 'too big to fail' and austerity in Britain is creating what will become a very expensive public health crisis. The pressures on an increasingly weakened welfare state grow as the downward drive on wages drives up poverty. Despite being one of the richest in the world, ours is a country where 1 in 6 children and 1 in 3 disabled people live in poverty. For George Osborne (who, incidentally, didn't even study economics), austerity is the Only Answer, whatever mad ideas Roosevelt might have had about spending your way out of economic crisis (yes, the mad idea that got the global economy back on track following the Great Depression). He gestures frantically to a small increase in "our GDP" and calls it a recovery, but many Britons don't buy it and less than 1 in 5 feel any benefit to their family. We can see why it might look like recovery from one of those golden chairs at the Lord Mayor's Banquet table - the rich are getting richer. But for most working families, life keeps getting harder. These days, questioning the values that dominate establishment economics is practically political heresy. But what Osborne doesn't seem to grasp is that GDP is not an end in itself. Here's what three years studying politics and economics has taught me about GDP: it stands for Gross Domestic Product, but should probably stand for Giant Distraction Programme. It's the sum total of all goods and services of monetary value produced by our economy in a year. It can go up while most of the social indicators of wellbeing for the majority go down. As far as GDP is concerned, a pound made selling a bomb, burying toxic waste or repossessing someone's house is as good as a pound made growing food or inventing a lifesaving medication. It tells us nothing about the wellbeing of our children, the dignity of our elderly and our sick, the value of art, the strength of our families and communities. It's a measure of profit, not a measure of progress. So as a value against which to judge policy - it's totally useless. The right-wing now seek to fill this ideological deficit with a host of moralistic arguments about austerity summed up by the Conservatives' new slogan that they are "for hardworking people." And by 'hardworking' they do not mean formerly-hardworking pensioners, would-like-to-be hardworking graduates, hardworking mums, the hardworking poor or the hardworking immigrants who helped build the British economy. As the rhetoric defending austerity moves from the incomprehensible financial jargon to a moral defence, it becomes more intelligible - but more disturbing, bigoted and effective are re-directing blame and getting bosses and politicians off the hook. Themassive departure from reality of public perceptions of benefit fraud rates and immigration levels indicates the extent to which the media has acted as a megaphone for the establishment line. As Thatcher put it: "economics are the method; the object is to change the heart and soul." There is an argument that even a scrounger is less of a problem than the commodity traders and speculators whose 'hard work' created chaos, mass unemployment and starvation in the global South - but they give the Tories more than half their funding. This divide-and-rule politics is as old as the hills, and finds expression at the international level in media debates over the Eurozone and international development. The resurgence of nasty cultural and racist stereotypes give the impression that countries like Portugal, Spain and Greece entirely populated by 'super-scroungers' stop work to nap in the afternoons. Here's what we should see when we look at Greece, once one of the greatest civilisations in the world and a pioneer of ancient democracy: a country whose labour force work some of the longest hours in Europe; where under austerity, suicide is up 40% and healthcare 'reforms' have left a million Greeks without healthcare access; where infant mortality is soaring and schools are suffering power cuts; where fascist parties like Golden Dawn thrive amidst the gross inequality and disillusionment that the far-right always exploits, but where the Greek people continue to resist the politics of hate and are building a movement for a better future. The state of the global economy, the destruction of our natural environment, the War on Terror and the rising tide of poverty and inequality are all born of the shallow depths and narrow limits of our democracy. Politicians and the media often make the somewhat patronising assumption that political non-participation is born of apathy - people have just stopped caring. The truth is that it's born of outrage with politicians, historically low levels of trust in social institutions and a growing hunger for an alternative. UKIP represents one alternative, with its politics of prejudice and populist rhetoric covering what is ultimately a fairly status-quo manifesto. The other alternative, rooted in a politics of hope, involved what Russell Brand on the demonstration called a "recognition of our common unity." It is represented by all campaigns and community groups represented in the People's Assembly, fighting back while we still have something left of a social democratic state to defend. But we don't just want to go backwards - we want to move forwards to a fairer, more equal, and democratic country for the next generation, preferably with less violence and an intact ozone layer. We can do better than accepting, cap in hand, what this millionaire coalition and its so-called opposition can offer us. That's what the demonstration on Saturday was about, bringing together a whole range of issues in a single call for the right to set the course of our society. It represented a collective refusal to roll back into the deprivation of pre-war Britain, and we will keep coming back until we make the change.